It is two hours before daybreak, but the Trump train, the Orange line subway from Vienna, Virginia, is filling up with the inaugural-minded. They are sitting in twos and fours, heading into Washington, D.C., with their hats and caps and buttons and slogans. With their optimism and well wishes for the incoming president, and disdain for those not yet on board. It is one theme of the morning, part of the mood of part of the city, and, as at every inauguration, a proxy for the emotions of the nation watching the day unfold. Lindsey, who wants to be part of history, and see the Trump family, is slightly nervous about protesters. Amanda shrugs the thought off. “He’s going to be president, there’s no turning back, so get over it,” she says. There is a distinct racial patina to the crowd. The few black and brown people in sight are at work, or heading in. 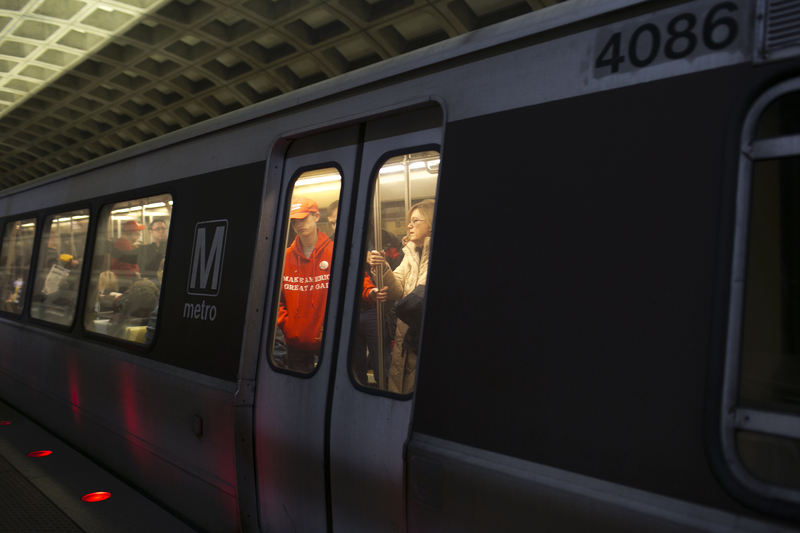 People ride the metro the morning of the Inauguration for Donald Trump. Once downtown, red, white and blue lights bathe evergreen trees in the median strip of a busy street, and American flags jut from the sod every few feet. Matching red, white and blue lights from a dozen police cars, with more coming every minute, slice through the morning darkness. A large black man sits on a folding chair at the corner of 17th and Connecticut Avenue. “Screw Donald Trump” his sign says. “It’s going be a long day,” he predicts. Messages compete for primacy in the power corridors of the city that bring people into conflict. It’s the nature of Washington and events such as the inaugural, which are central to people’s understanding of the nation and where they fit in it. Shortly after 8 a.m., nearly four hours before the swearing-in, the crowd heads toward the Capitol and the city begins to lose the everyday look of itself. “Make America Great” hats top every other head and you are walking not so much into one America, as one version of America. In this version, the cultural rituals of black life are suspended. You’re don’t nod at another black person on the street in solidarity, for instance, because 92 percent of black people voted against Trump. At a security checkpoint, Greg Agee, who flew in from Newport Beach, California, takes a selfie and says he just told his wife, a Hillary Clinton supporter, that he was attending the inauguration Friday, though he bought his plane ticket right after Election Day. His mother-in-law is no longer speaking to him. 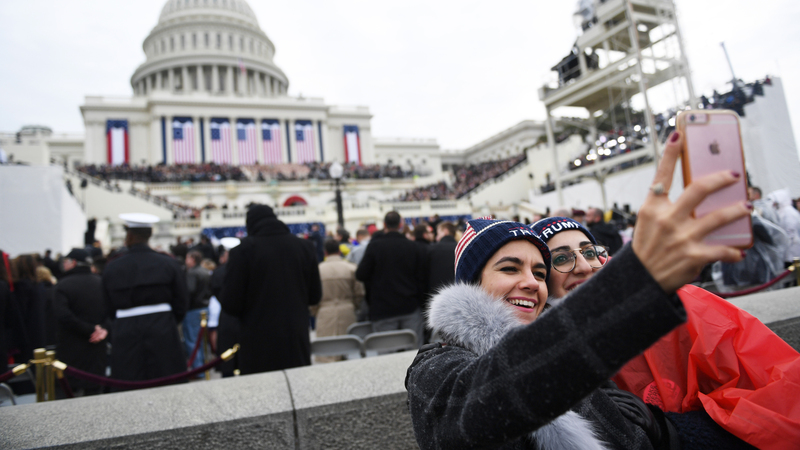 Supporters of Donald Trump take selfies before the start of during the inauguration of President Donald Trump January 20, 2017 on the National Mall in Washington D.C.
By the time you’re situated on the West Lawn at 11:30 a.m., listening to the VIP announcements, the Mormon Tabernacle Choir, and the boos for Sen. Chuck Schumer (D–N.Y. ), it feels like you can almost count the people of color in the crowd. A walk through three sections of folding chairs reveals only five black people. One of the five is Laur Wilson of Wheaton, Maryland, a certified public accountant for a local radio station. “I joined the Trump train from the get-go,” she says in a Jamaican accent. “I wanted to see this historical event of Donald Trump. Such an unusual candidate. So controversial, so many enemies, yet so powerful.” Wilson wants to see an increase in inner-city jobs, and improvements in the economy. Also some deregulation “to help get business going,” she says. Some at Wilson’s church disagreed with her support for Trump, she says, but “I think there are a large number of people who are quietly enthusiastic,” and praying for him. 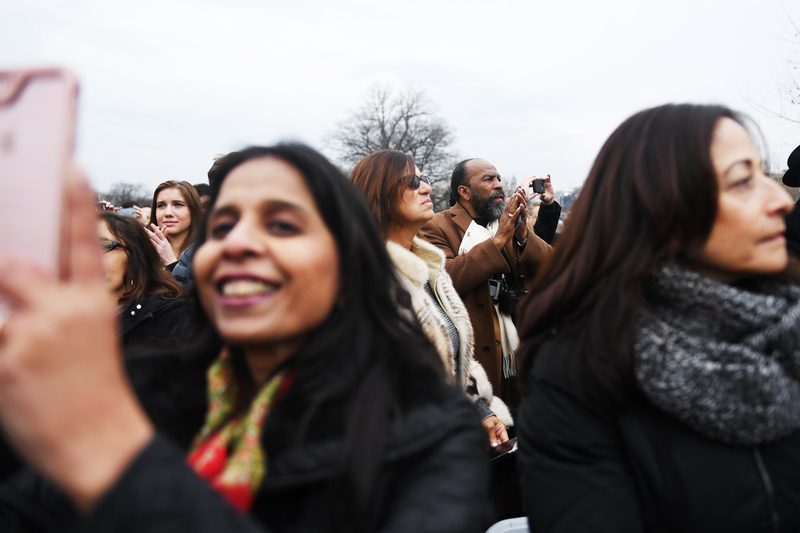 Kennis Wilkins, right of center, applauds when the President Barack Obama takes the stage during the inauguration of President Donald Trump January 20, 2017 on the National Mall in Washington D.C.
“Trump forever!” someone yells out. Afterward, walking out into Washington, now under new management, and toward the parade route, more people of color are visible, vocal and enthusiastic. They are almost exclusively vendors. 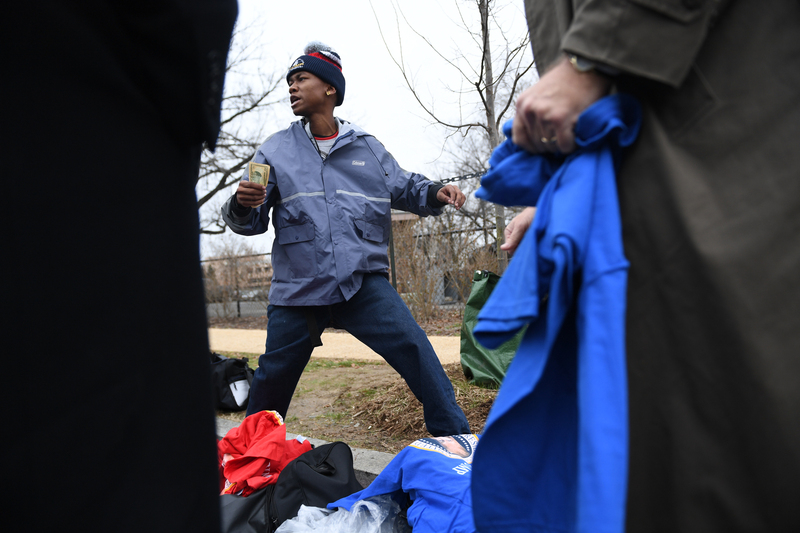 A young black man on the corner of Washington and D streets is hawking T-shirts, caps and knit beanies with fluff balls on top. He has a fist full of dollars and won’t even slow down long enough to put the money in the pockets of his blue jeans. A guy calls out for a blue beanie, but he’s out of them, so he snatches the one from off his head. “That’s a smart young man,” says an admiring bystander. More of America starts to show up, and the capitalism gets more aggressive. “Trump that b—-!” a guy yells, advertising his T-shirts. “Donald [expletive] Trump!” yells another. “Y’all ready for this?” A police officer asks him to yell on the other side of the street as people pause to take videos. A tall young black man passes with a “44” on his shirt and it takes a moment to register the tribute to Obama. A woman pushes a carriage with her 13-month-old daughter inside with a sign affixed to it that says “The United States of Immigrants: Citizens, Veterans, Muslims, Christians, atheists, Jews, Asians, natives, whites, blacks, Latinos, boomers, Gen-X, millennials, LGBTQIA, the disabled, the poor, the one percent, the middle class.” Somebody told her she was abusing her baby, she says, but other than that, people have been civil. A sign outside St. Mark’s Episcopal Church offers visitors a place to rest and get warm. “Impeach Him Already,” a sign says. The more you walk, the more divided the sentiments. Outside Union Station around 2:30 p.m., crowds cheer “The Trump Truck,” a white pickup covered in Trump stickers, driven by a waving black man. A few feet away, hundreds of protesters and Trump supporters argue bitterly. “No Trump, No KKK, No Fascist USA,” a protester leads the chant into a megaphone. A woman with a sign that says “free hugs,” walks up to embrace her. Afterward, the Trump supporter continues yelling. A young man with a U.S. flag, a Trump cape around his neck and a “Trump USA” cap argues with another group of young men. 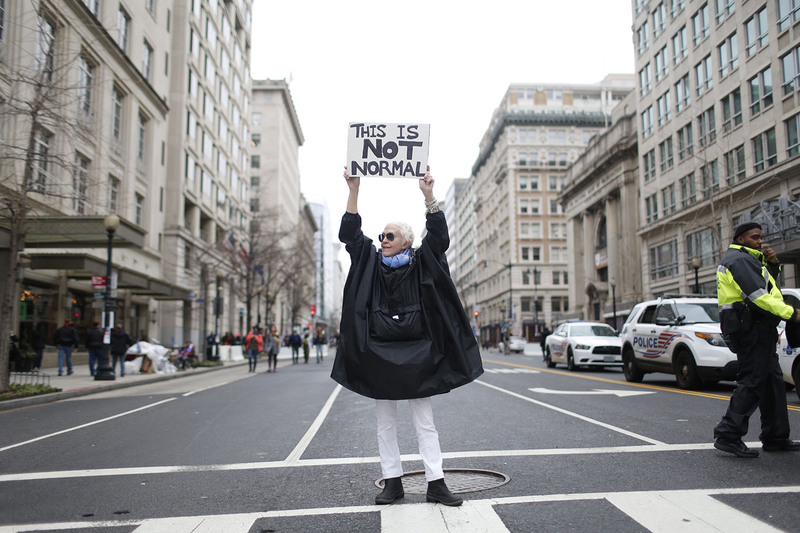 A protester stands in the middle of a usually-busy downtown street in Washington, D.C.
At the Navy Memorial on Pennsylvania Avenue, the roar of the crowd, cheers and cries of “Not My President” start to drown out conversation. Across from bleachers full of Trump supporters, a stage has been erected and speakers take turns denouncing Trump, racism, misogyny and oppression on loudspeakers. Black Lives Matter buttons and shirts are everywhere in the crowd as are perhaps a few dozen black people. Two young African-American women, Grace Peach and Asheea Smith, boarded a 1 a.m. bus from the Bronx, New York, to be here. A few feet in front of the women, protesters call out to Trump supporters, who are quiet and watchful and outnumbered in this crowd. They are separated by barricades, by police officers, by the 3.8 million-vote margin by which Trump lost the popular vote. By their understanding of and priorities for the country they live in. The women are hoping to see Trump walk the parade route, but predict there will be no rushing the barricades when the parade passes. “There’s a lot of discipline and military people out here,” Peach says, and their protest is peaceful even though she’s heard about fires and broken windows elsewhere in the city. Protesters chant as they leave the parade route during the inauguration of President Donald Trump January 20, 2017 on the National Mall in Washington D.C.
“Also, I think those people on the roof mean business,” Smith says, looking toward the figures in black dotting the tops of buildings. It is after 3:30 p.m., and, heading away from the parade route, police in riot gear block 12th Street and face an angry crowd. 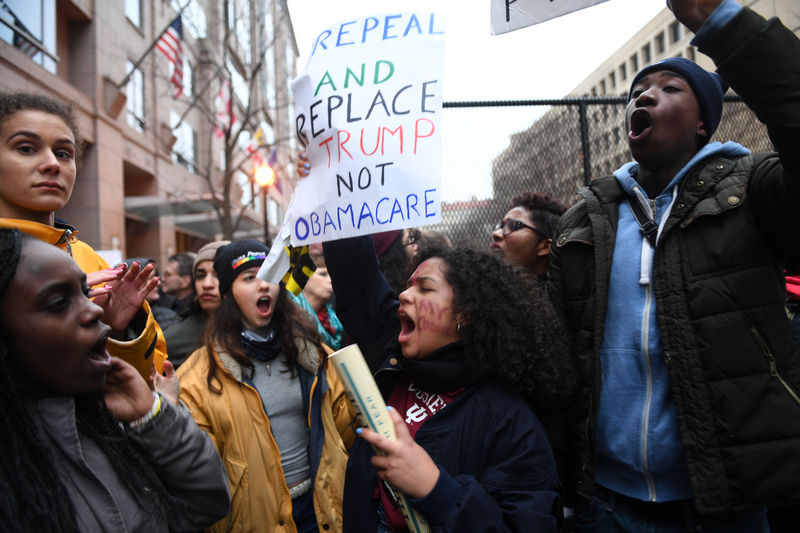 “This is what democracy looks like,” read one of the day’s signs. Parts of the city are roiling. Other parts of the city, of the nation, are tending to their business without noise or fanfare. The protest voices, the vendors’ voices, the Trump supporters’ voices, all begin to fade. Sirens and whistles blare in the distance. It starts to rain again, on both sides of this corner of America.